Andrew Ross & Craig Ponsford: An exploration of the science of milling and baking from a baker’s perspective. A two-day deep-dive into the nuances at the intersection of science and craft in baking. This interactive course is for professionals who seek to gain a deeper understanding of the scientific principles of the craft. -Dissecting certificates of analysis (COAs) and understanding corrections that can be made based on a COA: e.g. Falling Number, ash, protein, Farinograph, Alveograph. Day Two we will bake with flours designed to illuminate the practical themes outlined above. Professor ANDREW ROSS is a baker, scientist, and teacher who roams the world encouraging people to eat their whole-grains. 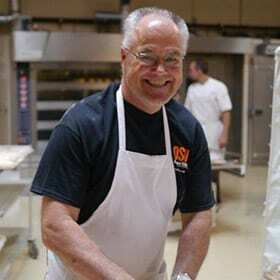 He has been a Professor in the Crop and Soil Science Department at Oregon State University for 17 years where he is the quality specialist for the Wheat and Barley Breeding programs and is a Professor in the Oregon State Food Science Department where he teaches classes in food chemistry, small grain processing, and food polymer science. For the past 35 years, Andrew has worked with, studied, and taught about the sciences of baking and cereal-based foods across the globe. Recent teaching events include workshops on baking science and hans-on workshops at Marie-Louise’s Køkken in Denmark, the Seattle Culinary Academy, the Grain Gathering, and the Cascadia Grains Conference.